1 ) Plants not included. 2 ) Pot measures 4.33 x 4.33 x 3.15 inch, metal stand size 4.33 (top) x 5.31 (bottom) x 5.9 in., plant notes tag size 2.5 x 2.7 x 0.15 in. 3 ) Rack color: gold. 4 ) This set includes a white round high temperature made ceramics pots, one free ceramic note sign and a geometric metal flower rack stand, ideal for decorating desks, book shelves, tables, window sills, living room, outside gardening etc. 5 ) Simple and elegant succulents flowers planter bowl, great for displaying indoor outdoor garden plants, like natural air planters, potted succulent plant, orchid, green herb system, lithops, aloe, violet, seeding, herbs, decorations, etc. 6 ) Classic designed cool novelty planter urn set with brackets, best for decorate book shelf of your house, office, desk top,kitchen, balcony, bathroom, living room, exterior, indoors outdoors party decoration. 7 ) Medium modern round decorative cute jar with iron bracket holder can also be used for small mini home desk ornaments kits funny container or organizer for your self, wife, husband, men, women, family. 8 ) Designed with watering drainage hole under the vase to help some plants like potting cactus drain the water, also suitable for greenery nursery greenhouse. 1 ) CREATIVE CERAMIC NOTES SIGN - Offered with free note sign to have your lovely plant's name, watering, temperature etc. put it in the front of the pot, or set some interesting flags to your flowers to make more fun. 2 ) HIGH TEMPERATURE CERAMIC - High temperature ceramic to make sure the most stable, strongest and durable quality, the high temp ceramic has high density to avoid water infiltrate to the pots to cause color change. Stronger and more durable and stable than regular ceramics flowers pots which are made of middle or low temperature ceramic. More easy to store and clean. 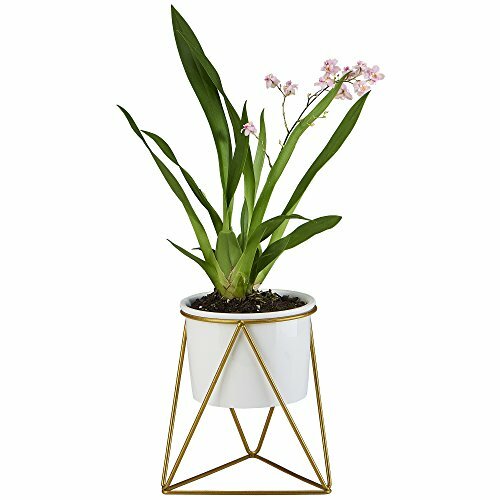 4 ) COME WITH METAL STAND HOLDER - Humanity design and beautiful looking metal stand let you more convenient to move and clean your lovely plant to your home decoration. 5 ) SATISFACTION - 100% Satisfaction Guarantee, 30 days return, refund or free exchange policy without hassle, You can get the full refund quickly or free replacement if you are not completely satisfied. If you have any questions about this product by flowerplus, contact us by completing and submitting the form below. If you are looking for a specif part number, please include it with your message.